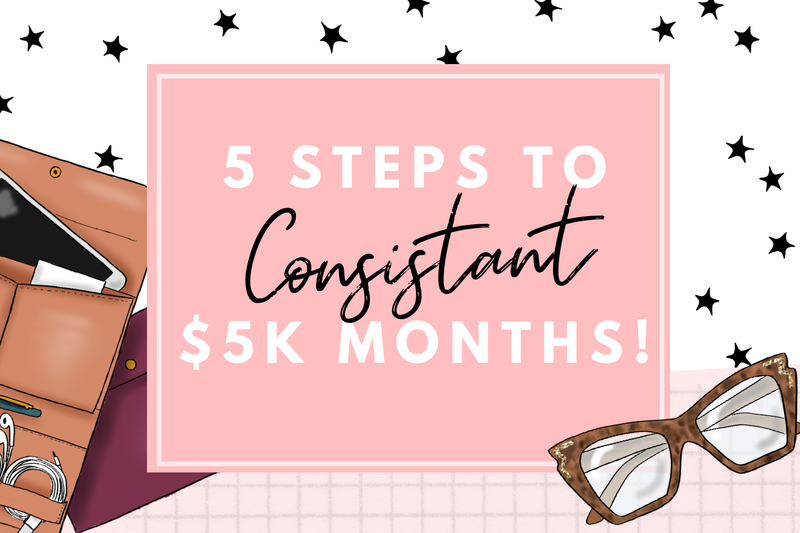 5 Steps to Consistent $5k months! Whoa is it possible to have consistent $5k months with online business? That's the question I pondered with in the beginning of 2018 and even now I sit here and a little anxiety creeps into my chest. I can barely make $2k a month let alone $5k! But this is a goal of mine this year and if I can get anywhere close to it I'll be one happy business owner! So that brings me to today, writing this! My goal this year has been to get to $5k months and make it consistent. We are in the last few quarters of the year and this is crunch time for so many of us. Will we be able to make our goals? What steps do we need to take to make it happen? Should I just give up after this year? The answer to that last question is NO by the way! You can't give up when things get hard! And the answers to the other questions is NOTHING IS TOO IMPOSSIBLE! So how can we make this $5k come to life? I got this idea from an awesome blogger and youtuber by the name of Nora Conrad! Her blog post and video inspired me to just go for it! Over the course of the next few months I'll be dishing out blog post that will help you and I on this journey! Income reports will be shown monthly and tips and tricks to show you what I'm doing for maximum success. Look I'm not saying we all will be able to get there but I'm saying we can get doggone close to it! Don't give up when things get hard. Stay consistent and for goodness sake don't beat yourself up if you don't reach your ultimate goal! So by the end of this year, here's my goals I set in place for myself! Goal Tip: By giving yourself 3 different goals you want be able to beat yourself up about not getting to your maximum goal. I learned that from Allison Marshall from Wonderlass! Right now these passive income streams are increasing since I've create the She Bold Stock Website. Which makes me excited for the future of these two streams buuuut I definitely need more streams of services to get to my goals sooner rather than later. So for this purpose I'll be focused on building a passive income shop for this blog! I've been devising a plan to create more ways to help out bloggers and entrepreneurs create gorgeous imagery and content for their website and social media! So I'm so excited to start sharing more about that soon. 1. Price what you are worth! It's important to have a clear idea of how much you should be charging for your products. I spoke about this in an article a while ago. How many clients I need to work with and the benefits I can provide them? How many members do I need to get and the benefits I can provide them? How many customers I need to have and the benefits I can provide them? I need to make sure that these are manageable and sustainable. So that means I need to price what the products are worth. Some will be higher and some will be lower! I focus on affordability most for She Bold Stock and for people who are working as hard as I to make a life they want I want to keep it that way. However at a business stand point I'm also creating future incomes that are a little higher in order to make that $5k month happen. If you charge to low you may just be repelling your ideal clients or customers because they may look at your service or products as low value! Working a full time job and doing my side hustle can be overwhelming to say the least so I need to focus on managing my work-life balance at all cost so I want get burned out. So that includes not putting too much on my plate a one time. So I'll be focusing on one future passive income at a time! When you burn out you have the tendency to not be as consistent and you'll want to just quit! 2. Get yourself out there! Ok so half of us is probably introverts but come one its the freaking internet! I'm talking to myself to when I say this. You'll never earn the income you want just by being in the corner. Get up and make money moves(Ayyye Cardi B reference). Start building relationships with others from within your industry to potential customers, clients, and audience. Get on several platforms where your ideal audience is. For me it's definitely instagram! So I need to focus on several ways to be more present on there. Another platform I want to utilize more is facebook...facebook groups to be more specific! When it comes to blogging, I definitely want to get back to that! So you'll be seeing so many more blog posts on business tips and motivation. I'll include more call to actions in order to get more people on my list and I can share even more value in their inbox! I'll also update old post to fit 2018's standards. Speaking of email lists! This is something I want to work on more. So I'll include more freebies in blog posts. Videos is something that I always wanted to do more consistently but work has always gotten in the way. My goal is to try out small mini videos on IGTV and Instagram Stories to make it easier on me. Then I can share those videos on my youtube channel too! It's important to utilize every avenue to get yourself out there. Maybe one day I'll add in live videos and webinars but uuuuum I'll work my way up to that. Still an introvert over here haha! 3. Contact and interact with potential clients or customers! Oh triggering your anxiety huh! Yep it's scary but just go for it! For me, in my business what I can do is if I see a potential client that has amazing products that I would like to work with I would simply send them a quick dm or email and tell them that I love their work and let them know what I offer. Quick and simply no hard selling! If that is a little daunting for you(as it is for me too) try just engaging with that client more on your social platform of choice. Once they see you interacting with them they'll definitely want to see what you are all about! You could either get a long time follower of yours or a potential client or customer in the long run. Have potential clients that have emailed you? Don't get nervous now and leave them hanging. Email them back as soon as possible to get the ball rolling. I used to be so nervous and I would take a whole day just to respond but now I've gotten comfortable enough to email them as soon as I see them and I'm not busy. Being quick in your responses aids in trust with your clients. Same goes for customers who have questions! Potential clients that never followed up? Check back in to see if they have any concerns or questions. Be willing to give advice to them. People get busy so a follow up is definitely something that will help them decide to pursue your service. This is something I'll be doing this week! 4. Believe in yourself wholeheartedly! Short and simple, if you don't believe in yourself how the heck are you going to succeed! So say affirming words that will charge you into action! Click here for some affirming words that will help you win the battle with your mind! Yep, this is something I struggle with. I say "I can do this all on my own." However, in reality I'm wearing myself thin! Sure we are able to do it on our own but at what cost? Are you missing out on time with your family, friends, or partner? What about your self care? You don't want your passionate side hustle to become something you hate! So build up your team! Find people who you can outsource too. Do you need a virtual assistant or a social media manager. Do you need someone to design your website while you are working on your business plan? Do you not have time to take your own photos, then hire out a photographer, like me, to give you a better representation of your brand. What's one thing that I absolutely hate doing in my business? Who can I turn to, to help me with this? What kind of support do you need in your business? Look at family members who can help you out. Look at friends who understand what you are going through. Maybe y'all can vent and plan together! Try to find a tribe of online girl bosses that can hold you accountable to you succeeding. By being accountable it will motivate you to work harder for your income goals. Ok so I truly hope that this will help you take the step to achieving your income goals! No matter how big or small I'm rooting for you! Click here to become part of the passionate creatives community to receive tips and resources to help you succeed in every aspect of your business growth! Come with me on my journey! 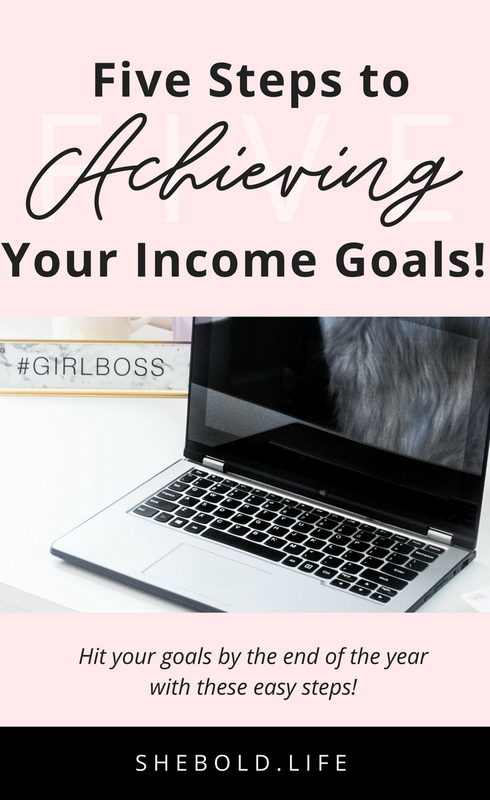 What income goal are you trying to achieve! Will you be trying out these tips? Your enthusiasm is infectious. I'm now motivated to set my 3 goals too. 5000 sounds like the ultimate goal, far but possible if we're persistent. Great idea about being on IG stories to be relatable and show your face!! I'm so happy to have witnessed your shift from blogger to businesswoman. Love your insights. The problem I have is that when clients see I'm outside the US they automatically expect a low price despite the quality of work I can guarantee. Sad. But yeah, I'm cheering you on.